Hacksaw Ridge would seem to be an odd Oscar contender. The first word on the film was excellent but when it came out critics liked it but didn’t love it. Its odd mix of old school sensibilities with modern realistic war violence jangled some writers who liked part of the film but not the other. For me the film is a masterful technical achievement and if it doesn’t quite nail perfection it still ranks as one of the most arresting war films I’ve seen while at the same time being a grand examination of faith and belief. 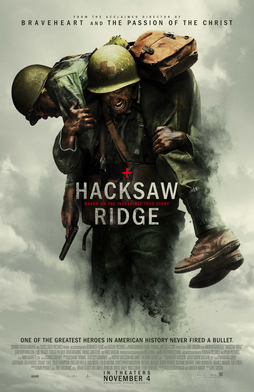 The film in nominally the Desmond Doss the first man who was a conscientious objector to win the (Congressional) Medal of Honor without firing a shot. Doss managed to save the lives of 75 men during the battle on what became known as Hacksaw Ridge before being wounded and carried off the battlefield himself. I say nominally because director Mel Gibson and his writers Robert Schenkkan and Andrew Knight have refashioned the story to compress the battle into a couple of days and leave out that Doss and his men had fought in Guam and the Philippines before the assault on the ridge. This isn’t to lessen what Doss did, rather to say that what Doss actually did was even more amazing. Gibson’s film is a decided throwback to old Hollywood. The first hour of the film where Dos is seen growing up and going through basic training is the sort of old school Hollywood film we’ve seen a thousand times before. A stern dad, loving mother raise their boy to overcome adversity. The guys in the army are on some level your typical grunt. Gibson is keeping everything simple. In the second hour, as the men get to the ridge the film becomes a hellish nightmare. We get a taste of it at the start but it isn't until the battle actually starts that the notion of war being hell and the true meaning of the chaos of war truly comes into play. Gibson’s use of old school stylings is brilliant. While it seems to simplify things it actually gives a greater emotional resonance. Gibson can work more starkly- the divisions between characters are greater. Doss’s actions seem more heroic. Because he alters our perceptions to a time before he makes the blood and gore more shocking once the battle happens. The perfect compositions and leisurely paced first hour make the total chaos of the final 80 minutes all that more over whelming.We have no sense of place other than where we are at that moment. There are no wide shots or anything but the ground and the craters the soldiers experience. Rarely has a narrative feature shown the hell of battle this brutally. Even most people’s bell weather Saving Private Ryan wasn’t this graphic or disorienting. Gibson isn't just telling a story. Gibson is ruminating on the notion of faith, belief and what a hero is. The notions of it run through the film from start to finish and they are what make HACKSAW RIDGE more than just a war film. I know some people have scoffed at the religious bent of the film. I've had discussions with a couple of people who think Gibson went over board, but at the same time this seems to be who Doss was. On top of that the film is a kind of hero's journey or spiritual quest of the true believer to find salvation. This is a refashioning of the tale in terms that Joseph Campbell might use. If the belief in god offends you see it as an allegory. Gibson is also very interested in what is a hero. Yes it's very easy to give lip service to the notion that Doss was a hero, Gibson on the other hand wants you to understand why. That is and what the notion of his heroics really are. We also get a lovely sense of why and how Doss turned out as he did because of the sequences with his father, in particular the sequence when he shows up at the court martial in his old uniform to essentially join his brother in arms. HACKSAW RIDGE is a masterpiece. It is one of the truly great war films. It confirms, despite his personal nonsense, that Gibson is one of the best directors working today with everyone of his films being moving visceral experiences.